You may have noticed in our specifications for our various lighting products the reference to numbers and phrases such as “4000K” and “5000-6000K” and wondering what this really means in regards to our products; well here is a small section to let you in on all you need to know. “K” is the abbreviated symbol for Kelvin’s. The Kelvin is a degree of temperature on the Kelvin scale, which is a scale used to measure the colour temperature of a light. The Kelvin scale starts at absolute zero, referenced as 0K, which is around -273.15°C or -459.67°F. Each degree K above 0K is equal to the same in Celsius, e.g. 1°K = 1°C. The lower the light temperature rates on the Kelvin scale, the ‘warmer’ and more red the light appears to the eye. The higher on the Kelvin scale a light rates, the ‘cooler’ and more blue the light appears. The scale starts with Infrared light (thermal imaging), and goes through to Ultra Violet light (UV water marks and forensic detection). As an example; the sun rates at around 5500K on the Kelvin scale, hence its bright but yellow coloured appearance to the eye. In relation to our lighting products, our floodlights and tiles all have a colour temperature rated on the Kelvin scale to help you identify the kind of ‘white’ light they provide. Our warm white floodlights are 3000-3500K giving them a ‘warm’ yellow glow, whereas the cool white floodlights are 6000-7000K making them brighter and ‘whiter’ with almost a blue hue. 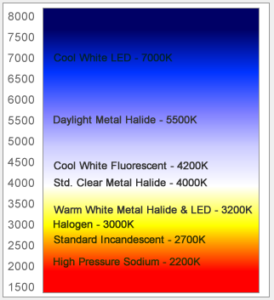 Below is a simplified version if the Kelvin scale for comparing the different types of lights and the colour temperature they have, so you can identify which light is best for you. If you have any further questions about the Kelvin scale or colour temperatures, call our sales team on 0845 5330495 and we’ll be happy to help.